Anand Agricultural University (AAU) Recruitment 2019 . Anand Agricultural University (AAU) invites Online applications from eligible indian candidates for recruitment of 60 Junior Clerk Vacancies.The employment details about the posts, age limit, educational qualification, experience and other conditions are given below as link. The candidates are requested to go through the details and ensure that they fulfill the minimum prescribed criteria before applying. Apply on or before 25 January 2019. Age Limit: as per AAU Rules. Selection Method : Skill Test & Interview . How to Apply : Eligible candidates can apply through the official website http://www.aau.in on or before 25 January 2019. Educational Qualification : MBA (lnternational Agribusiness / Agribusiness Management) OR M. Sc. (Agri.) in Agricultural Economics. Age Limit: Maximum 35 years for male and 40 years for female. Educational Qualification : M. V. Sc. in (Veterinary Medicine/Veterinary Parasito logy/Veterinary Microbiology/Veterinary Pathology). How to Apply : interested candidates are requested to send their application on plain paper along with complete biodata stating as per attached proforma to the Project Incharge and Professor & Head, Department of Veterinary Medicine, College of Veterinary Science & A. H., Anand Agricultural University, Anand – 388001 on or before 28-05-2018. Application should have o’Cover Letter” clearly indicating “Name of the Post” and “Name of the Project” for which candidate is applying. Please attach certified copies of allthe relevant documents chronologically and also bring original documents at the time of interview. Educational Qualification : M.Sc . Educational Qualification : M.Sc in Agri or MicroBiology . Anand Agricultural University (AAU) Recruitment 2017 . 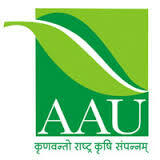 Anand Agricultural University (AAU) invites Online applications from eligible indian candidates for recruitment of Assistant Professor and its equivalent in various disciplines.The employment details about the posts, age limit, educational qualification, experience and other conditions are given below as link. The candidates are requested to go through the details and ensure that they fulfill the minimum prescribed criteria before applying. Apply on or before 22nd February 2016. Educational Qualification : Good academic record as defined by the concerned university with at least 55% of marks (or an equivalent grade in a scale wherever grading system is followed) at the Master’s degree level in a relevant subject of concerned faculty from an Indian University. Anand Agricultural University (AAU) Recruitment 2015 . Anand Agricultural University (AAU), Anand invites Application for the post of 06 Research Associate, Junior Research Fellow & Field Assistant. The employment details about the posts, age limit, educational qualification, experience and other conditions are given below as link. The candidates are requested to go through the details and ensure that they fulfill the minimum prescribed criteria before applying. Apply before 08 October 2015. For Research Associate : Ph.D in Plant Breeding and Genetics OR M.Sc. (Ag) in Plant Breeding and Genetics having First Class with at least 2 Years of research experience. For Junior Research Fellow : B.Sc. (Ag) OR M.Sc.(Ag). For Field Assistant : Diploma (Ag). For Research Associate : 40 years for Male & 45 Year for Female. Selection Process : The selection will be made on Written Test & Interview. How to Apply : Interested Candidates are requested to remain present on 08.10.2015 at 09:00 hrs. in the Conference Hall, Nr. Principal’s Chamber, B. A. College of Agriculture, AAU Anand-330110 Gujarat with application on plane paper along with original & copy all the relevant documents. Date of Walk in Interview : 08.10.2015 at 09:00 AM.